The Gilbern GT was Gilbern Sports Cars first production kit car. Starting life with fibreglass bodywork mounted on a multi tubular steel chassis. The supplied kits tended to be complete, using brand new mechanical components and even the bodywork painted. The owner just needing to assemble some mechanical components to get round the purchase tax system of the time. 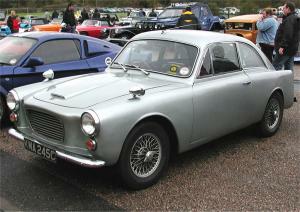 The first GT models were mechanically based around the Austin A35 and then the Morris Minor 1000. In 1963 the 1800GT was a mechanical improvement utilising engine, gearbox, front suspension, rear suspension and brakes from the MGB GT. The Gilbern owners club state that 277 GT's where built in its various forms, even some later ones having the Ford V4 engine installation. The GT was superceded by the Gilbern Genie in 1966/7.